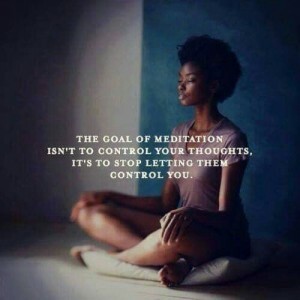 There are many different types of meditation but the style that is most widely understood is the type that requires you to clear your mind and be perfectly still. For me and many others, this is pure torture. The minute I tell myself “clear your mind of all thought,” is the very second my mind takes off at warp speed to travel the universe and create a million tasks for myself or it provides a running commentary of all the stupid things I have done during my entire life. If you have this same or similar experience, I suggest a different method. Instead of clearing your mind of all thought, simply watch your thoughts as they happen. Be the observer and watch your train of thought without engaging or jumping aboard. Let your mind flow from thought to thought. Allow your deep and slow breathing to slow the speed at which the mind is traveling. Mindful meditation is the practice of becoming the observer instead of the one that thinks. Nurture your observer. Create distance between the thoughts the mind is thinking and your awareness. Our consciousness does not reside in the mind or the brain. Our consciousness lives in our energy field, in our cells as well as the space that immediately surrounds our body. And the observer can simply watch thoughts and not be them. Release the idea that in order to meditate you must be able to silence the mind. While that may work for Buddhist monks in the mountains of China, that is not the only way to meditate. Think of meditation as slowing your breathing down and watching your mind wander instead of attempting to stop it from thinking completely. Deep slow breath. Observe the mind. Deep slow breath. Observe the mind.